"Few critics of the period saw Mingus as part of the hard bop school. Yet his musical explorations were never far afield from it. Had he recorded for Blue Note, and drawn on the services of other musicians affiliated with that label, these links would have been more evident." Charles Mingus grew up in the Watts area of Los Angeles. He first attempted to learn trombone and cello, but after being frustrated by poor teachers he took up double bass in high school, studying with Red Callender and a former bass player with the NY Philharmonic Orchestra, Herman Rheinschagen. He also studied composition with Lloyd Reese. He played with Barney Bigard's ensemble (1942), and toured as bass player in the big bands of Louis Armstrong (1943) and Lionel Hampton (1947-48). In his first recordings he accompanied jazz musicians and rhythm-and-blues singers, and as "Baron Mingus" led diverse ensembles. He gained national attention as a member of Red Norvo's trio (with Tal Farlow) in 1950-51. Thereafter he settled in New York, where in the early 1950s he worked with Billy Taylor, Duke Ellington, Stan Getz, Art Tatum, and Bud Powell. Some of his performances during this period, including the famous concert at Massey Hall in Toronto with Charlie Parker and Dizzy Gillespie, and several of his early Jazz Workshop sessions, were preserved on recordings issued by Mingus's own company, Debut Records (1952-55). In the mid-1950s Mingus's activities as a composer became increasingly important. Along with Teo macero, Teddy Charles and other experimenters, he contributed written works to a Jazz Composer's Workshop from 1953-55. He founded a new workshop in 1955 in which he transmitted the details of his works by dictating lines to each player. Over the years this 4- to 11-piece group included such musicians as Jimmy Knepper, Booker Ervin, John Handy, Eric Dolphy, Roland Kirk, Jaki Byard, and Mingus's lasting associate, the drummer Dannie Richmond. In the early 1960s he endeavored unsuccessfully, to free himself from economic dependence on the white commercial jazz scene. 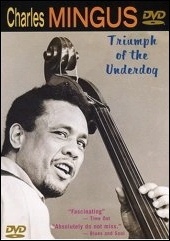 He presented a disatrous rehearsal-concert at Town Hall, New York, in 1962, and was unable to find a publisher for his remarkable autobiography, Beneath The Underdog; his second recording company, the Charles Mingus label, issued only a few titles in 1964-65 before collapsing. By then Mingus was in dire financial straits and suffering from deep-seated psychological problems. During his remaining years he wrote big-band music and traveled extensively with his workship until 1977, when he fell seriously ill.
Mingus's accomplishments surpass in historic and stylistic breadth those of any other major figure in jazz. As a double bass player he commanded an awesome technique and was thoroughly conversant with all styles of jazz extant during his lifetime. 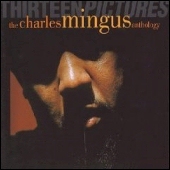 A selected discography of Charles Mingus albums. New Tijuana Moods, 1957, Bluebird. Blues and Roots, 1959, Atlantic. Mingus Ah Um, 1959, Columbia. Mingus at Antibes, 1960, Atlantic.